Many people who have dentures can still experience difficulty speaking or chewing properly, not to mention uncomfortable slipping and movement of the dentures along the gums. Implant-supported dentures, also known as implant anchored dentures, offer a significant improvement over more traditional teeth replacement options. These advanced treatments are designed to dramatically enhance the stability of partial or full sets of dentures, reducing the potential for slippage and eliminating the need for messy adhesives. Our experienced dentists and skilled team at Saco River Dentistry offer customized implant-supported denture treatments that can help you achieve results that look and feel more natural and comfortable. Implant-supported dentures utilize between four and six dental implants to “anchor” a full-arch denture to the mouth. 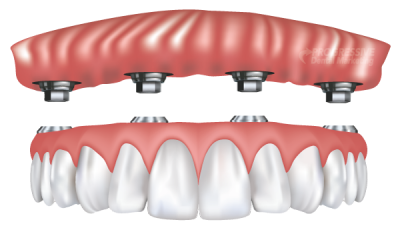 Implant dentures can also be used to replace a section of missing teeth in one or more quadrants. Since fewer implants are used, healing time is often reduced, as is the cost (compared with a full set of dental implants). And since the denture is stabilized by the implants, there’s no more slipping, and messy adhesives are unnecessary. Furthermore, implant-supported dentures are designed to be durable, natural-looking, and easy to care for—simply brush and floss as normal. If this sounds like something you might be interested in, we can help you determine if this or another procedure can assist you in obtaining the results you’re seeking. What Are My Implant Denture Options? Each person’s needs and goals are unique, which is why we offer a broad selection of options to suit a wide range of individuals. Below are some of the techniques we can use to help you achieve a healthy and beautiful smile. If you are missing all your teeth on the top or bottom arch, All-on-4 can provide an implant-supported denture using just four implants, rather than a full set. This can provide stability, comfort, and beauty in one. This is a popular option for patients who are not candidates for a full set of implants or do not wish to replace each missing tooth with an individual implant. Similar in concept to All-on-4™, All-on-6 uses six dental implants, rather than four, to secure a denture to the upper or lower arch and replace the missing teeth in that area. This approach may be used if insufficient jawbone is detected or to provide additional comfort and security. Our dentists can evaluate your oral structures to determine if All-on-6 is the more appropriate technique for you. If you are missing teeth from both the upper and lower arches, a full mouth reconstruction can help repair and restore your smile. In this customized procedure, we will utilize a combination of techniques to achieve the desired outcome. All-on-4 and/or All-on-6 can be a part of the plan, depending on your unique needs and goals, as well as other potential treatments based on your evaluation and what you would like to do. One of our dentists will meet with you during an initial consultation and perform a comprehensive oral evaluation. If implant-supported dentures are a good option for your needs, our dentist will then create a detailed treatment plan. The implants themselves are composed of titanium posts that will be surgically placed into the gum in the area of missing teeth. Over the next few months, the posts should fuse to the jawbone, becoming a permanent part of your mouth. Once this has taken place, our dentist will affix the dentures onto the implant for the most durable and stable fit possible. Treatment plans using dental implants can vary in cost for a number of reasons, which is why the best way to find out how much your implant-supported dentures will be is to schedule a consultation. Factors such as the complexity of the procedure, number of dental implants placed, materials used, and other considerations will play a role in the price of implant dentures. We strongly believe that everyone should have access to a healthy smile and comfortable dental appliances, and we will work with you to find an approach that best fits within your budget and lifestyle. Generally speaking, dental implants can range from about $3,000 to $4,500 each, according to recent estimates from the American Academy of Implant Dentistry. To aid you in your research, we will provide a detailed cost breakdown, so you can make the best decision for you. If you are interested in financing options, our practice can help you find a solution that meets within your budget. For more information on implant-supported dentures, or to schedule a consultation, please contact our practice.